And great coverage by Southend Seattle, picked up by KOMO News! Over 960 backpacks were distributed, with a list of almost 100 more children who will receive backpacks this week. And this year’s first time Book Exchange distributed 800 books. Entertainment included excerpts from the Broadway Bound production of God Lives In Glass, student poets from Empire Nights, the Southeast Seattle Community Youth Orchestra, and Charlie the Clown. Dignitaries on hand included Seattle Mayor Mike McGinn and Seattle School Board members Betty Patu, Harium Martin-Morris, and Peter Maier. Over 20 organizations, schools, and agencies shared information with families about services and opportunities in Rainier Beach. Thanks to all who attended and helped to make this such a terrific event. PreviousGod Lives in Glass premier performances this weekend! 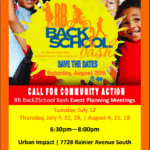 Help prepare for the 8th Annual Rainier Beach Back2School Bash! 10th Year of Rainier Beach Back2School Bash deemed a success!!! Mayor Johnson will talk about his path from the NBA to education reform and the organization he founded, St. HOPE, which helps inner-city kids get to college through community engagement, quality educational opportunities, and after-school programs. 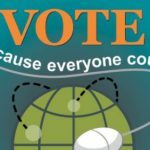 Thursday, October 7 at 7 p.m.